Prayer leads to better care! There is an occupational hazard for pastors: Someone always needs them. There are always church members who need care, counsel, wisdom, and direction. And at the same time, there will always be people outside the church who need the gospel. Those demands and needs create unique pressures for every pastor. A pastor who says yes to all of the ministry needs often says no to a spouse and kids. When pastors have a personal crisis, many pastors may feel alone in their struggles and have few people to turn to for true support. How can you support your pastor? 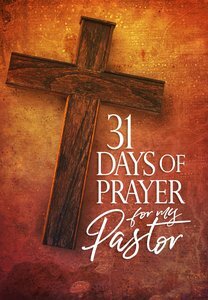 31 Days of Prayer for Your Pastor provides inspiration and insight into what it means to be a pastor, along with Scriptures, prayers, and promises to declare over your pastor. God has given you your pastor for a purpose. Support this spiritual leader through prayer and see your life be blessed. About "31 Days of Prayer For My Pastor"
Dr. David and Teresa Ferguson have shared a Biblical message of health and relevance for more than twenty-five years. Their passion for seeing the Great Commandment of loving God and loving others lived out among God's people has led them to impact thousands of ministers and their laity. They are co-directors of Great Commandment Network/Intimate Life Ministries. David has a M.Ed. from Texas State University and two doctoral degrees from Oxford Graduate School. He is a member of the Oxford Society of Scholars.